I’ve just received this report from one of our Club members that may be of interest. You’ll see from that penultimate paragraph regarding the loss of a big YFT that he might well be in the running for the Club’s Crying Towel trophy - best ‘hard luck’ story - this year. "We completed two FAD trips out of Los Suenos marina in August aboard Tom Carton boat ‘Dreamworks’ - https://www.captaintoms.com. Went with Tom, my friend Jez and crew - Victor aged 28 and his brother David 22. Elder brother taught younger one all he knows, with Victor spending his birthday fishing with us. What a great pair to have on the boat - very polite, good English and excellent mates - 1st class with baits, tackle and everything. You could not fault them, together with Tom with his boat handling. It was a great couple of trips. Trip 1. Went to No 1 FAD, 80 miles offshore and released five Blues, then motored out to No 2 FAD at 115 miles caught 8 Blues, a Black and Sailfish all in approximately two half days fishing. Trip 2. Went to FAD 2 and released 19 Blues, again in effectively two half days fishing. We caught about 30% on live baits and the remainder on blue/white Islander lures fished over Ballyhoo. The areas were loaded with bait - Skipjacks and, mainly, Yellowfins. Small silver spoons were jumped on as soon as you put them in the water. 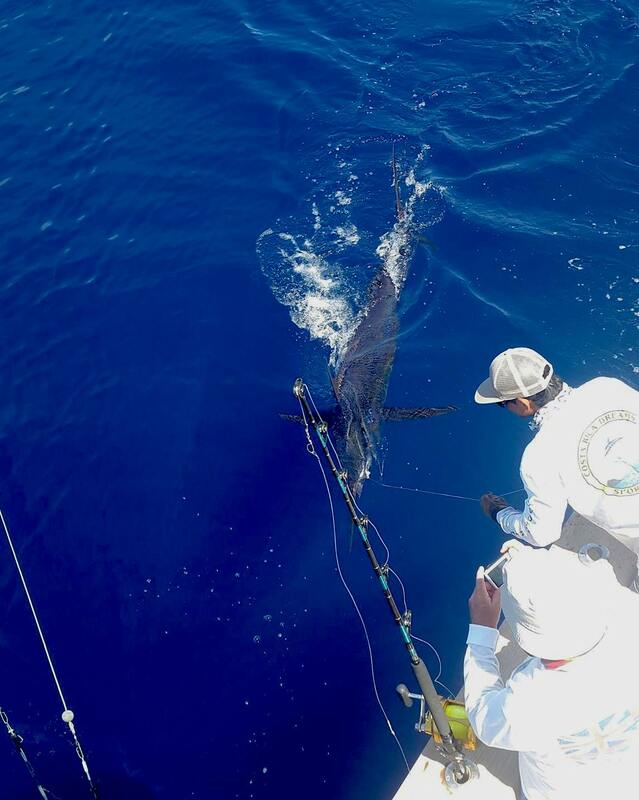 Most of the Marlin were caught on 50s with perhaps five on 80lbs. My friend Jez caught five, but a back injury ended his participation, with my boat builder’s son releasing two. I managed to catch the other 26. In the main they were in the range 175 to 300lbs with a couple 425/450lbs, with the Black a nice fish over 400. We also spent a day Tuna fishing caught seven YFT in the 45 to 70lb range. I however hooked a nice one on an Islander with Ballyhoo and fought it for about an hour and a half on 50lbs test. Had the double line out of the surface a few inches twice, but it did not like the boat. A big fish and lots of pressure in the fighting chair. Tom has had them to 360lbs and this was a decent fish but the bearings on the Penn International 50 seized up and my line broke! The boat ran great, a very enjoyable trip."